The camping cot is invariably one of the basic requirements of a great camping trip. Without a proper cot, you cannot have proper sleep, and often severe sleep deprivation or the lack of it can mar the complete thrill and excitement of the camping trip. 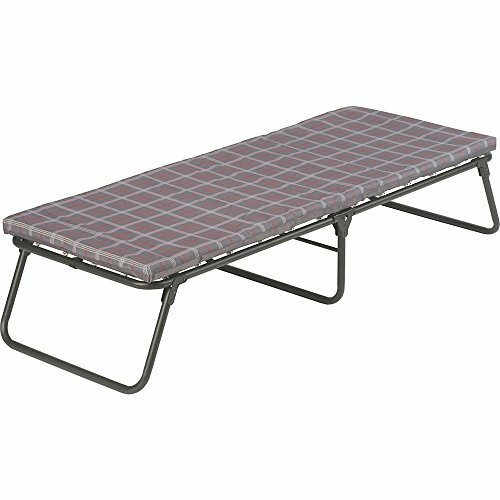 Therefore, whenever you are planning for a camping trip, deciding on the best camping cot is a primary necessity. Only a good quality cot will help bring a semblance of home like comfort even in the wilderness. 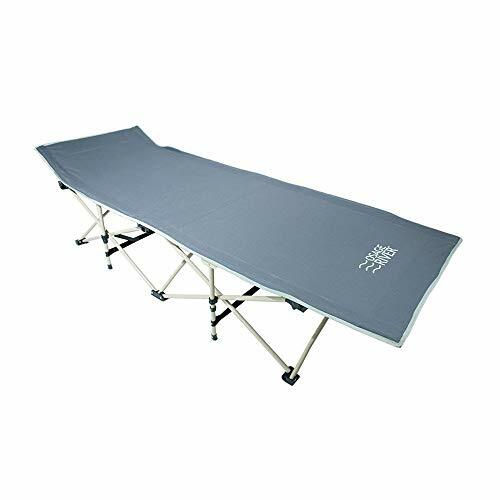 Moreover, a good camping cot is a necessity. The cold hard ground is both risky and difficult to get used to. As a result, a whopping 90% plus campers have complained of sleep-related problems during the course of their camping trip. The cot also takes care of another potential hazard too. Out in the wild, you have no control over the creepy crawlies that invade your private space. But a cot helps you to easily handle this problem. Bugs and creepers seldom climb up to the cot and as a result, you can be extremely safe from their onslaught for a major part of your trip. This also gives you enough piece of mind to guarantee better sleep. But deciding on the best camping cot can be a significant challenge. You have to look for comfort, quality, affordability and also an easy to carry portable cot. Often it is only the coming together of all these factors that can guarantee a great quality trip for you. 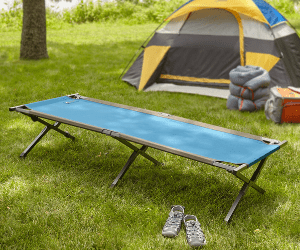 So, we decided to make your task a lot easier with our comprehensive guide on how to buy the best camping cot that also fits your budget rather comfortably. We have shortlisted some of the top names in the industry and rated them against a range of factors to make sure you get the best bargain. 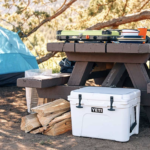 Coleman is one of the best-known brands in the camping space. 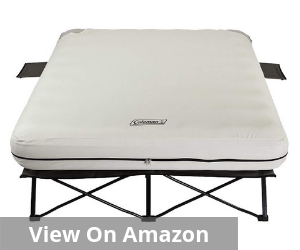 No doubt, the Coleman ComfortSmart is amongst the best camping cot available. 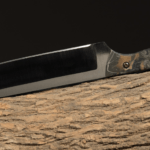 It is lightweight, portable and known for delivering absolute value to its customers. The home bed like comfort and a restful night’s sleep is the assurance that Coleman cots give you. They use better technological innovation to guarantee better support. 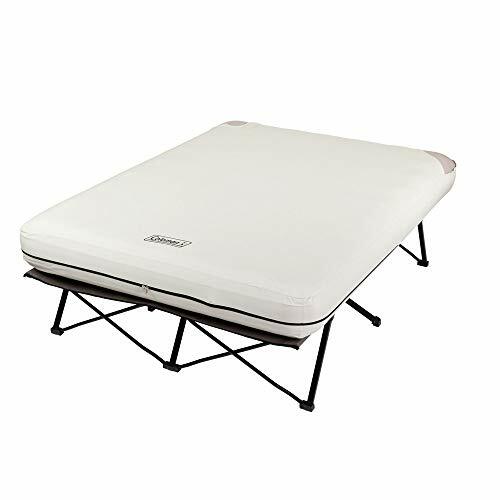 This is equipped with a coil suspension system and thick foam mattress that undeniably enhances the degree of support to a great extent. The durability and strength of this cot frame also deserve mention. It is sturdy enough to support over 250 pounds in one go. Even in terms of height, people close to 6 feet can sleep almost comfortably in the cot. But despite these statistics, this cot represents brilliant design fundamentals. It can be folded and can easily fit into a car trunk. So carrying it to any place is never a hassle either. The fabric used in this cot is also extremely user-friendly and can be washed and dried in a comfortable manner. Click here to see the best price. Considerable load bearing capacity and can comfortably accommodate even slightly hefty individuals. However, folding this bed is slightly tricky in tight places. That can be problematic, especially if you are using this in constricted areas. Inconsistency in packaging may have been a concern for few. They have received the product with the fabric ripped off in the middle. Replacement is, however, an option that you can explore if something like this happens. 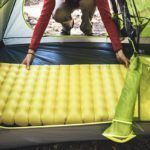 Whether you are planning a camping trip or expecting guests at home, this Coleman Queen Airbed is decidedly one of the best camping cots. 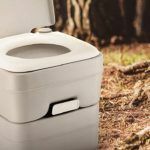 Spacious, portable and sturdy, this can easily be the reason why you start enjoying your camping trip decidedly more. During camping, this cot can be no less than a game changer in the scheme of things. This is a particularly sturdy bed and can accommodate people who are even more than 6 feet tall. It can support almost 600 pounds and make for a comfortable sleeping arrangement for quite a few together. The ComfortStrong coil construction offers unlimited support and comfort. That means the time has finally come to bidding adieu to creaking uncomfortable mattress and jumping on to the next level. This mattress comes with an AirTight system and uses a 4D battery-operated pump to blow it. This cot is specially equipped with an AirTight system that makes sure that there is no unnecessary leakage and the mattress maintains its shape through the night. The versatile design of this cot ensures that it is an equally great option whether you plan indoors or outdoors. 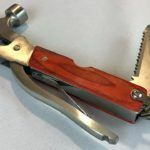 This comes in a proper storage bag that can be carried around quite easily almost anywhere that you may choose to without posing any problem. Click here to see the best price. Extremely comfortable air mattress with practically no instance of air leakage. The storage bag does not meet the quality standards and comes across as flimsy and unreliable as per some user reviews. 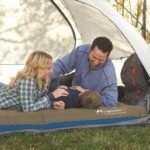 The reason why the Teton Sports Outfitter is counted prominently amongst the best camping cot is undeniably the pivot arm. This new innovation plays a significantly important role in putting the last end bar in place quite easily and rather quickly. The reinforced steel S-leg makes it a particularly sturdy piece. It offers support, stability and a significant amount of strength to bear load successfully. The placement of the legs also makes this a superbly portable folding cot. 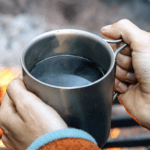 So whether you are in your camp or at home, setting it up and putting it back in place is equally simple and easy to do. 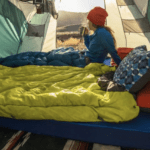 So when you are outdoors, you can finally do away with sleeping on the floor and enjoy a good night’s sleep on a Teton bed. 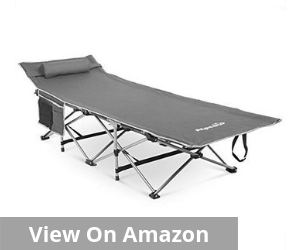 This bed also has a fantastic load bearing ability and can comfortably accommodate more than a couple when you are camping. This means, even when you are traveling in large groups, you can easily carry just a few of these, and you will be sorted. Additionally, this camping cot comes with a sturdy oxford storage bag to keep in when not in use. That means stacking this bag is never a worry and you can keep it comfortable and out of the way when you do not need it. Click here to see the best price. 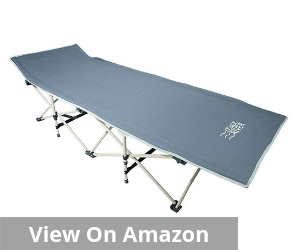 When you are looking for the best camping cot, The Alpcour also features quite prominently. Whether you are camping, at the beach or backpacking, this cot promises home-like comfort when you crash onto your bed at night. This lightweight portable cot is designed for excellence. It is easy to set up and simple to fold and store in the tote bag that is provided along with this cot. This is made of soft breathable material and can withstand a reasonable amount of weight. The steel tube frame of this cot is durable and long lasting. The padded pillow and the side pockets that come with this cot are added advantage. They make this cot comfortable and functional in nature. Moreover, they also offer the necessary storage area next to a bed in a campsite. The pillow ensures you don’t have to carry additional luggage and one cot addresses all your sleep-related requirements. Click here to see the best price. However, the attached pillow with this cot is not up to the mark and can be easily done away with. 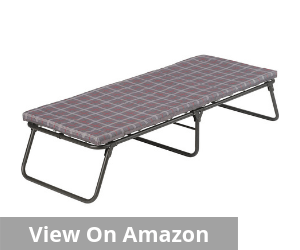 This extra wide bed is one of the best camping cots that you can hope to buy for your next camping trip. Whether you like sleeping on your back or your sides, this is the bed that can guarantee you maximum comfort and almost gives you a home-like feeling even in the midst of an absolute wilderness. The frame of this cot is made of tubular carbon steel. It is known for its sturdy structure, lightweight dimension, and absolutely comfortable feel. Once you set the bed up, you do not have to deal with wobbly movements either. This has the much talked about “X’ frame construction. Rugged, robust and absolutely easy to operate it is one of the ideal options for your camping trips. 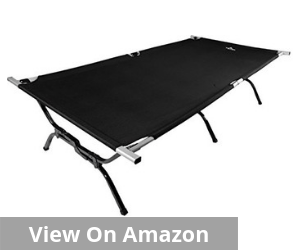 This is also an extremely versatile and multifunctional bed. That means apart from camping, this is a convenient option when you want to create space for sudden guests at home. The comfortable heavy-duty PVC coated polyester fabric also deserves a special mention. It makes for appropriate comfort as well as a sturdy covering of the cot. This is a water-resistant and lightweight fabric that absolutely enhances the pleasure of sleeping in this cot. 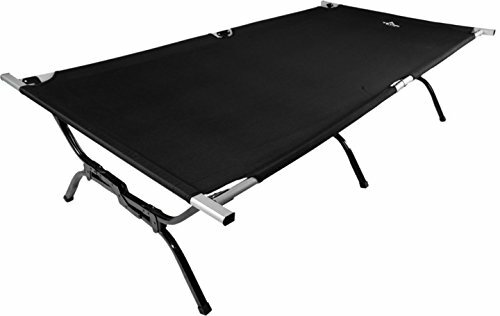 Operationally too, this is the type of cot that is extremely portable, easy to navigate and can be easily considered for any kind of trip. Click here to see the best price. Inconsistency in manufacturing quality seems to be the biggest bane of this cot manufacturer. While you have a certain segment who are very happy, there are some for whom the cot break at the first use. This can make potential customers fairly apprehensive about whether they should at all go for this option. Therefore, if you are planning to buy the best camping cot, there are many elements that you have to pay attention to. Comfort and absolute relaxation remain the core consideration. You have to match many other features along with this cardinal element to narrow down on the best bargains. 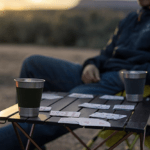 Different camping locations pose different challenges, and that is why we tell you the easiest way to identify the best bets that can help you give an edge in every situation. The overall frame or the structure of the camping cot is one of the most important considerations. When you are trying to narrow down the best camping cot, pay special attention to the frame of the cot. Ultimately this is that factor which will determine the long-term durability of the cot. Rust free steel or aluminum cots are amongst the most versatile options that can deliver value over an extended period. Select wooden ones may also pass the test but remember you have to carry the cot so the frame can’t be too hefty. It has to be lightweight and relatively easy to carry. The quality of fabric or the material used to cover the basic frame of the camping cot is the next most important consideration. Just like the basic structure, the fabric material also needs to be lightweight, washable and comfortable to sleep on. A prickly fabric can significantly hamper your sleep, and you can end up tossing and turning in the bed despite a cot. The natural fiber based blends offer the most compelling options and have the potential to deliver long term value. That is why make sure the best camping cot that you choose also has a comfortable covering. The size is also an important determinant of what goes on to become the best camping cot. 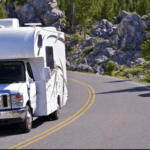 The dimension is dependent on the average number of people sleeping on the bed at any given point as well as what can be conveniently carried in your camper. The idea is to achieve a happy union of your comfort, the tent size and also offering maximum possible relaxation to your fellow traveler. Often you can also buy two similar sized smaller options instead of one big bed. This can comfortably address space constraint and also maintain the desired dimension that you need. 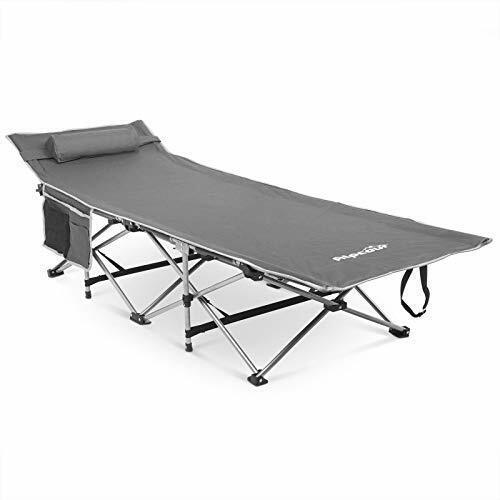 When you are deciding on the best camping cot, the portability factor needs to be factored in as well. After all, the idea of a camping cot will be totally defeated if you are not able to carry it to the appropriate location. So, lightweight and easy to carry are some of the most important factors. Also, go for cots that are easy to fold. This is because it enhances the portability element even better. But that does not mean you settle for flimsy ones with hardly any load bearing capacity. The risk in this is the bed may not be able to bear too much weight and give in right in the middle of the night. 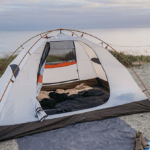 Therefore, if you are keen on getting the best camping cot for your next getaway, here is a comprehensive guide on how to get the most compelling bets. This cuts out the noise and helps you focus on the key options. Our guide helps you navigate the various factors that make a great cot and how they can affect your overall comfort. 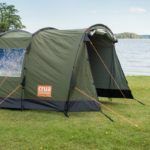 We walk you down the various facets of a great quality camping cot and how you can choose the most compelling version that suits your needs. Most importantly, you can check the relative return ratio based on your overall investment. The idea is to get maximum value from the money that you invest in.